Background: NOTES is the newest technique emerging in the field of surgery. We describe the transvaginal approach for endoscopic appendectomy in humans, probably the world’s first report. 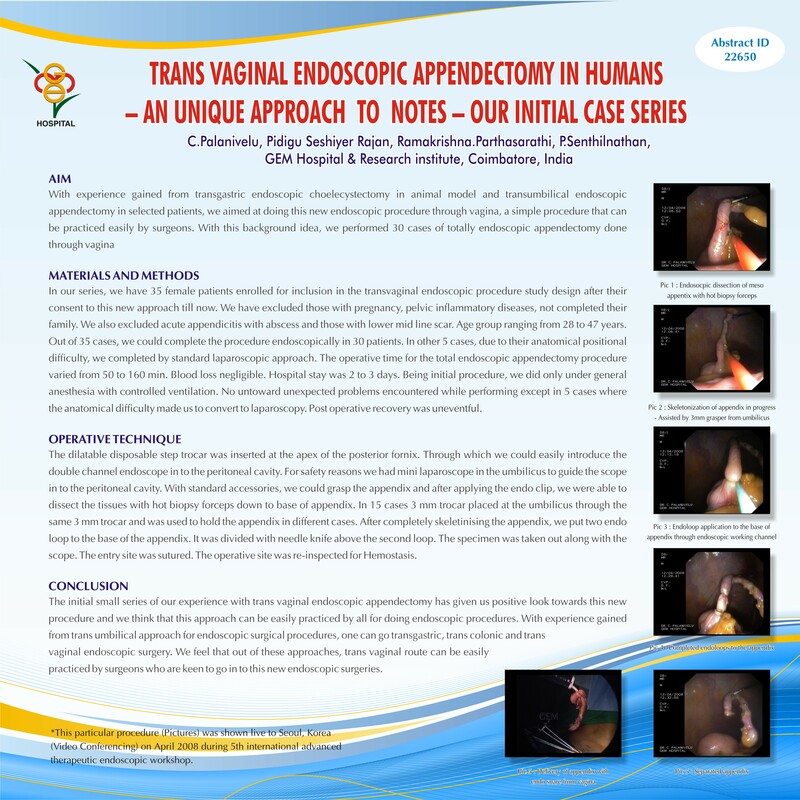 Materials and Methods: Out of a total of 6 patients, a totally endoscopic transvaginal appendectomy was successfully performed for 1 patient. Pneumoperitoneum was achieved via a Veress needle in the umbilicus. Peritoneal access was gained via a transvaginal approach through the posterior fornix. Results: The other 5 patients were either converted to conventional laparoscopy or aided by a laparoscope. The average age of the patients was 29.5 years. The mean operating time was 103.5 minutes. Hospital stay was 1-2 days. The vaginal wound was examined by the gynecologist and found to have completely healed during the first and second follow up. Discussion: So far in humans, transgastric appendectomy and cholecystectomy, and transvaginal cholecystectomy have been reported. A transvaginal endoscopic appendectomy in humans has not been reported yet. The technical ease of the procedure and early outcome seem satisfactory, though comparative studies are needed to confirm this.